Like a lot of you, the past few weeks have been quite busy for me. During the summer months projects, commitments and even ideas are somehow allowed to drift along on a warm breeze of school holiday-enforced hiatus. But come September the metaphorical whip is well and truly cracked. Many of you are by now up to your eyes with summer-interrupted deadlines and the daily scurry between work, family and after-school activities – and all points in-between. Maybe like me you are also vowing to shoehorn in a little extra exercise, or add in a ‘self-improving’ evening class. Time is not elastic, but we do our best to strain at the laws of physics nonetheless. I participate, therefore I am. My additional soupcon of activity this week was giving several nutrition workshops at the 22nd annual Scottish Conference of Cancer Support Groups (SCCSG). To be completely honest with you I was not wholeheartedly looking forward to it. I am used to my cosy number with the Maggies Centres: making food and discussing nutrition and cancer in the comfort of small groups. And my ‘target’ audience is clear: for the most part those going through treatment and their carers. The SCCSG audience was going to be hugely mixed and much larger and less intimate than my usual 6-8 person groups. And in a hotel conference space, not among the architectural nuances, squashy sofas and natural light of the Maggies’ Centres. You are right, I am spoiled. But, as is often the case with my fears, they were completely misplaced. This truly amazing conference sees delegates from all over Scotland gathering annually to update their research knowledge, share ideas, discuss common concerns and generally share and discuss ideas for helping those affected by cancer. All of the groups provide a vital service that just isn’t possible within the confines of the NHS. Every single person I met volunteers their time and skills to help others. In other words, good people. Inspiring people. Selfless people. And they wanted to listen to me. Wow. Despite my initial reservations at being able to entertain/inform three large groups of people for one and one-half hours at a time, I think it went well. There was clapping (small groups don’t clap, so this was new to me). On a personal level it was good to have broken out of my comfort zone, and of course to have met so many amazing people. I just hope that I expanded my groups’ knowledge and got them excited about all of the benefits of eating well. Even as I fade from their memories hopefully they will remember my Michael Pollan-nicked and tweaked motto: Eat Real Food, Not Too Much, Mostly Plants. For two days my stone age flip-chart and I extolled the virtues and benefits of a plant-based diet. I shouldn’t have been nervous about talking on this subject as it is something that we as a family practise on a day-to-day basis. We eat meat occasionally, but mostly it’s about the plants – the stuff that grows in the ground or hangs from trees. If it’s edible and available, we’ve probably tried it. I’ve never really gone in for the let’s- make-vegetables-taste-like-meat idea. If I want meat I’ll have a bit. I want my food to be true to what it is. Not an analogue of something else, as if it is a lesser option. A case in point is chili, or chilli as we spell it here in the UK. I haven’t had a good beef based chili in a while but I remember my mother’s ground beef one. It was outstanding. Slow-cooked on a low peep for a few hours, vegetable-less save for onion and garlic, and if she was feeling a bit wild, a green pepper. But she also made a mean vegetable chili which, as she became more health-conscious, was the one she always made for herself and my Dad (little sis and I had flown the nest by this point). It tasted of gorgeous beans and vegetables sassed up with half a dozen spices and a little brown sugar. No hint of meat. Delicious. Years ago she told me a sweet story of her first attempt at making a meal for my Dad when they were newly married. Why she was still trying to impress him at this stage is anyone’s guess, but she was, bless her. Anyway, she set about making his favourite meal, chili. She bought the best meat she could afford, lined the counter with appropriate little bottles of McCormick’s spices and got to work. Everything browned up nicely and smelled wonderful so she served up a big ladleful with some rice for my father, standing back awaiting praise. Praise did indeed come, but apparently it was false. While my father tucked in, all smiles beneath his trendy 60s moustache, my mother sampled hers and nearly expired with embarrassment. She had used cinnamon instead of chilli powder. Tablespoons of the stuff. My father abhors cinnamon. Truly hates the stuff. We blame those darn McCormick’s jars of old – they all look exactly alike. To this day, I always double check my spices as I have almost done the same thing myself. I wonder if spice blindness is hereditary? Today’s recipe uses some of the spices my mother used in her chili: allspice being the rather unique one that I think works really well here. I often serve it with cornbread – homemade as we don’t get mix packets here (heck, we don’t even call cornmeal, cornmeal), but sometimes with some oven-baked plain basmati rice. I don’t tend to serve it with two starches unless it is for company, so they can have a choice. The only other thing you may want is a salad or even some steamed broccoli. 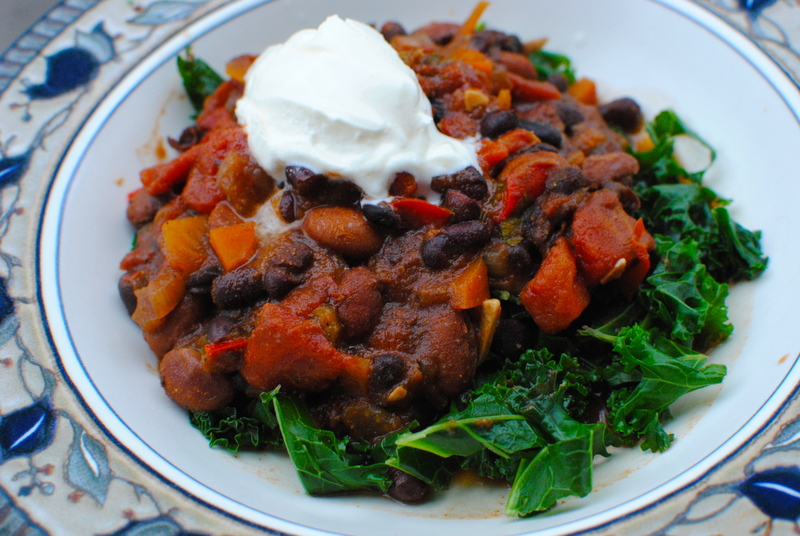 For leftovers the following day I served the chili over steamed shredded kale and it was really good. The nip of the kale complements the spices beautifully. I will be doing that again, for sure: a great trick if you are cutting back on excess starchy carbohydrates. 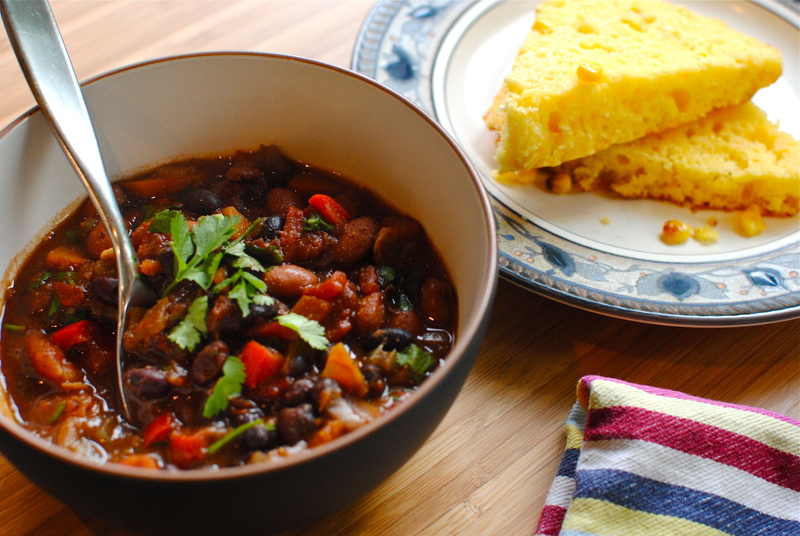 I like my cornbread too much to forgo it so will be having chili over kale and next to cornbread. I’m greedy that way. 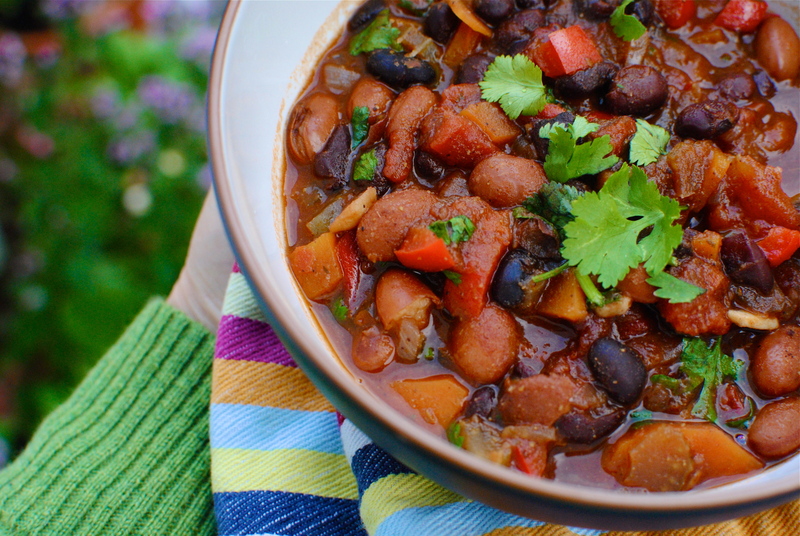 This is an easy and vegetable loaded take on traditional chili. Serve with white or brown basmati rice or – my favourite – cornbread. This recipe easily doubles for freezing or parties. The real deal. 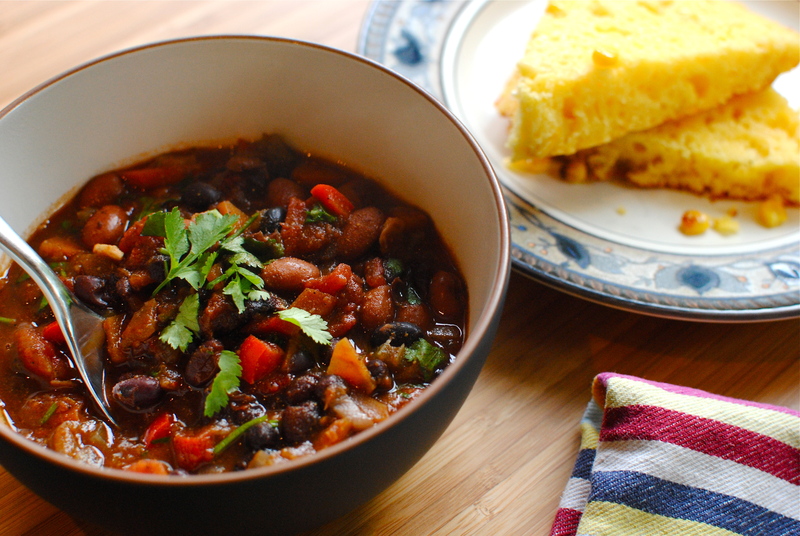 Serve with chilli, black bean soup – any soup really. I’ve converted this from my mother’s American measurements recipe into metric, but have included both because I use American cups when I make this. Use a cast iron skillet if you have one; it’s traditional and it gives the bread a fantastic all-over crust and somehow just makes it taste even more delectable. Add the butter to a 10 inch skillet or 8 inch round baking pan and place in a 200C oven. Don’t leave for longer than five minutes. In a medium bowl, stir together the flour, cornmeal, baking powder and salt. In a separate bowl, combine eggs, milk and oil. Make a well in the dry ingredients and pour in the egg mixture and any additional ingredients (see below). Stir just until moistened (may be a bit lumpy – that’s okay). Remove the hot skillet from the oven, swirl the melted butter and pour in the cornbread mixture. Return the pan to the oven and bake for 15 to 20 minutes, until risen, golden and starting to pull away from the pan around the edges. Well the timing of this landing in my in box was perfect. A wet Sunday & I was thinking about what to make for supper so it’s currently simmering away and smells glorious. It has taken me right back to my childhood where the village I lived in had a house party at the drop of a hat and neighbours used to pile round with big pots just like this. We had a fab mix of ageing hippies, Quakers, pilots, teachers and scientists in our street and we spent many a weekend dunking warm bread into big steaming pots together. You’ve taken me back, bliss, thank you. Oooooo mama, this looks good. I love making lots of quinoa chili and freezing it for busy nights. That cornbread looks amazing! Do you think it would work with vegan egg-replacer? I don’t see why not. Egg replacement tricky for me to get, but It should work. I’m thinking of experimenting with soaked chia seeds as an egg replacer. Have you tried that? I keep a few hens so I have a ready supply of highest welfare eggs but I would like to know for others, like yourself. Very much see myself making this chili (LOL, California spelling!) as soon as our late summer turns to fall. What a vibrant and healthy recipe for a windy, rainy day. I couldn’t agree more, keeping the integrity and flavor of the foods we choose to eat is the soul of great recipes. Well, I’m glad you are hanging onto to summer over in California. Not jealous, not a bit (she writes, crossing fingers behind her back). Here in Scotland it is in the 60s but bright and breezy today, perfect to start thinking about dragging out the crockpot, hoarding pulses and updating the warm spices. Today we are even having a bit of meat – a lamb, prune and chickpea tagine that I will write up soon. Veggies shut your eyes…Glad you agree with me about being true to your ingredients. It’s easier that way, and no one gets disappointed. Hi! I saw your comment at Foodtrainers and stopped by to check out your blog. Looks like you have some lovely recipes here-You chili looks delicious! I’m in California too, but right now where I am by the coast it’s foggy and drizzly-really perfect chili and cornbread weather actually. Will definitely try your recipe out! Yum! I’ve just made the corn bread & for those making it GF & DF, I used Doves Farm GF flour, soya milk & sunflower “butter”. I added the onion “option” and it really is fantastic. I’ve never made corn bread before & I’m hooked already, thank you! Thank you for the great GF and DF tips, Niki. I figured it would work but I am glad that you have put it to the test as GF, as well as doing it dairy free. I will make an amendment this evening after work to that effect. Let me know if you used any different measurements, esp re the liquid content. If there is any leftover (as if, with your ravenous teenage boys!) it is nice toasted under a grill and slathered with salted butter (Brittany?) and topped with a poached egg. Mmm. Haven’t eaten breakfast yet…. I’ve printed this off to make for tonight. With one vegetarian daughter in the family I am always looking for recipes that all of us will enjoy so I don’t have to cook twice. Lovely. Didn’t manage to find the ingredients for the corn bread, but made the chilli on Monday, me and the wee man had some for dinner last night with brown rice – very yummy. The leftovers are all mine along with some mashed avocado – NOM!!! Two of my favorite foods. I just remarked it was feeling like chili weather. 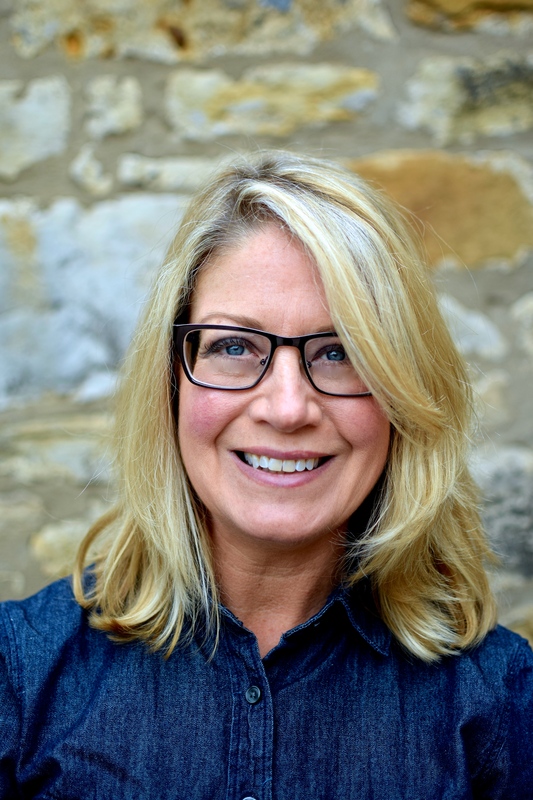 Thank you for stopping by Foodtrainers, I’m so glad to have found your blog. It’s a shame that summer has to end, but the cooler weather is more than compensated for in colourful trees, more beautiful light quality and, of course, different food ideas. After a certain point many of us want to have more hearty foods, and it’s good to have a few non-stodgy recipes up our sleeves. I hope these recipes fit the bill for you. Thanks for commenting. Hope to see you commenting again soon, Lauren. 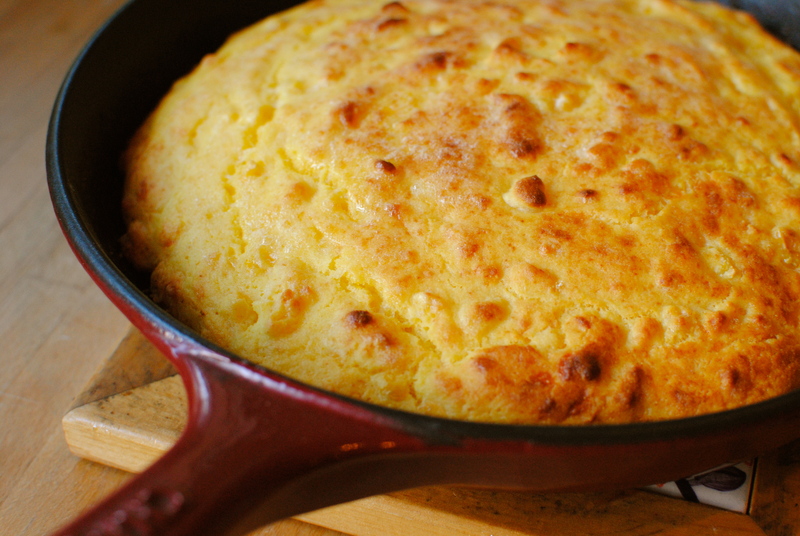 My husband made this last night with the cornbread – he impressed himself! Thank you so much – our kitchen these days is full of new wonderful ingredients. Your chilli sounds amazing and I’ve had a recipe for zucchini cornbread that I’ve been meaning to try for ages. I’ve got some arepa corn flour do you think I could use that and cut out the normal flour completely? 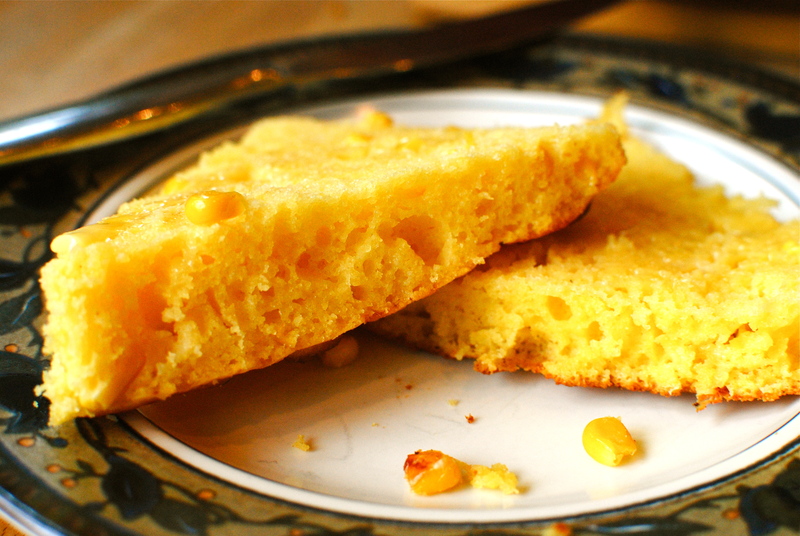 I’ve never made cornbread before but all recipes use flour as well as corn flour. Oh thank you. Your zucchini cornbread sounds really interesting. As for using arepas flour I hadn’t heard of it but had a wee scout around online and it seems associated pretty much exclusively with savoury pancakey things (all sound scrummy). I’m not sure how the grain is compared to wheat flour, nor of it’s properties. Could be an interesting experiment. My friend Niki commented on here that she used Dove’s g-f flour and that it worked. Perhaps you have something similar for general g-f baking? If g-f not an issue I would recommend just using the flour – maybe a refined spelt flour for extra B vits if you like. All cornmeal would be quite heavy and what you want is light and open. Does that help? Probably clear as mud! The Chilli was a hit with the little man too – he did pick out the aubergine but otherwise he LOVED it! That cornbread looks amazing Kellie. am going to have to try that!